If you're a fan of Star Trek on the small screen, then today is likely a good day. Production on Star Trek Discovery season 2 has officially kicked off, with filming on the new batch of episodes getting underway this week. Not only do we have word that filming is now happening on season 2, but we also have confirmation that a young Spock will appear when Star Trek: Discovery returns, which was previously just hinted at. So get ready to boldly go on a journey of speculation as to how Spock is going to fit into the narrative of the new season. Starting with the beginning of production on Star Trek: Discovery season 2, the news was revealed from several different sources. Doug Jones, who recently starred in the Oscar-winning The Shape of Water and stars as Commander Saru on the series, took to Twitter to let fans know that filming is commencing. The actor posted a video of himself shaving his head, since he has to wear a lot of prosthetic makeup for the role, and since his alien character is bald. Jones was playful, but didn't seem thrilled about saying goodbye to his hair. "Welp... so begins season 2 filming tomorrow." The news was also shared by the official Star Trek writers Twitter account by saying to fans, "Production of Season 2 begins tomorrow! What are you most excited about?!" Jonathan Frakes, who is known best for portraying Commander William Riker on Star Trek: The Next Generation, also shared the news with his followers saying, "Have a great shoot!" Frakes directed an episode of the show's first season and will return to direct episode 2 and episode 10 of Star Trek: Discovery season 2. Jonathan Frakes was recently a guest at El Paso Comic Con and revealed which episodes he's going to direct. The more interesting reveal is related to Spock, who is one of the most beloved characters in the history of Star Trek, first portrayed by the late Leonard Nimoy in the original series. Fakes revealed during the convention that a young version of Spock will indeed be included in season 2 of the series, but further details weren't disclosed. Justin Oser, host of Star Trek: The Next Generation show Earl Grey, had this to say on Twitter. "Frakes says he will be directing episodes 2 and 10 of season 2 of #StarTrekDiscovery, episode 2 will have Anson Mount as Pike and a young Spock that we'll see in flashbacks. Frakes also said there will be a young Burnham in the flashbacks for episode 2 of season 2." So not only are we getting a young Spock, but we're also getting Anson Mount as Captain Pike. Unfortunately, no actor has been confirmed for the role of Spock on the series just yet. 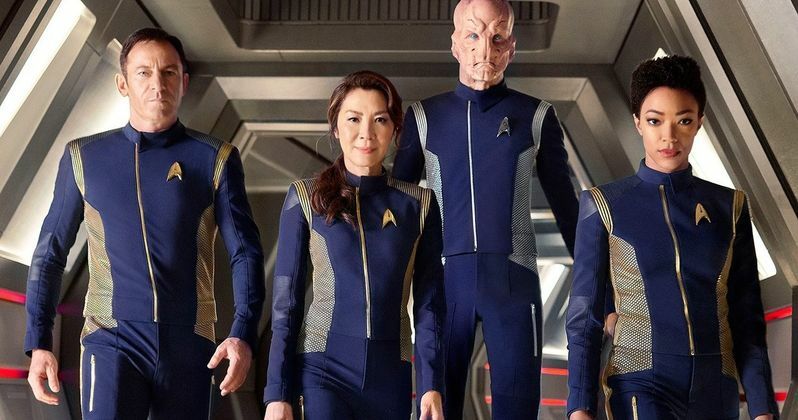 Star Trek: Discovery season 2 doesn't yet have a premiere date, but the series will continue to air exclusively on the CBS All Access streaming service. This news was previously reported by Comicbook.com.